This is really a saddening news. Dr. Changsheng Li passed away on October 18, 2015 after battling with cancer. 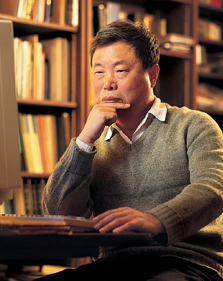 Changsheng had been a research professor at Earth Systems Research Center, UNH for 25 years. He was very kind and very easy to get along with. He always had smiles on his face and always had time to chat about science. It was my honor and pleasure to work with him for 6 years. We had written research proposals together several times. We had a research project funded by NASA through the Carbon Cycle Science Program last year. We also co-advised a postdoctoral research associate and a visiting student. Changsheng is a world-class scientist and is well respected. He is the architect of the widely-used DNDC model. He also made tremendous efforts in training and educating younger scientists worldwide over the years. He enjoyed spending time with his family, oil painting, and poems. Changsheng’s decease is a great loss to his family, the scientific community, ESRC, and our group. He will be missed by many people.